Happy Friday everyone! I thought I would change it up a little bit since I have shopping on my mind! It's looking more and more like spring outside, which makes me excited for new spring clothing. I have been super into buying dresses lately because they are just so easy to throw on and bam you have an outfit. I recently bought this chambray dress and I LOVE the way it fits. It's loose but still has some sort of shape so it doesn't look like you're wearing a bag lol. I posted about these sandals last month and I recently bought them. They are adorable but I bought a size 9 and wish I would have gotten an 8.5, darnit. This bag is so cute and I love the ivory color for spring and summer. Normally, I would lean towards a more tan or cognac color but this ivory is fresh and beautiful. Too Faced makes some of my favorite palettes. I have the Semi-sweet and original Chocolate Bar palettes and I love them both. When I saw that they were coming out with a Peach-toned palette I got so excited. I love wearing peach/ coppery eye shadows and these looks beautiful! It's sold out online but I'm hoping to find it in stores soon. I love patterned shorts with any color solid top. It's an easy outfit that's always comfortable to wear. These twill shorts are adorable and the vertical stripes are super flattering. 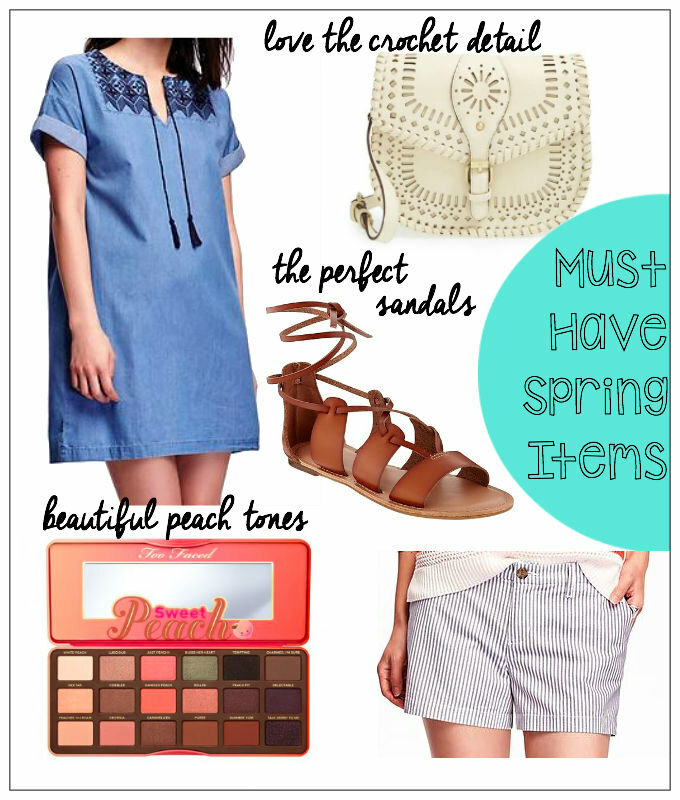 I would love to hear what items you are buying for the spring season! I love light pinkish eye shadows shades so that palette might be right up my alley! I'll have to check it out!! Love that purse!